The chapel of Santa Margarita was originally part of a 19th century Carmelite convent, which became a Roman Catholic chapel in 1880. The name of the first priest’s mother was Margarita, so it’s probable that the church was named after her patron saint. The chapel is long and narrow, with whitewashed walls. At one end is the entrance, with a small, curving balcony above, where the organ is placed. At the other end is the chancel, with a simple silver cross on the wall, above which is a painted statue of St Margarita, accompanied by a toothy dragon at her feet, looking rather like a household pet. 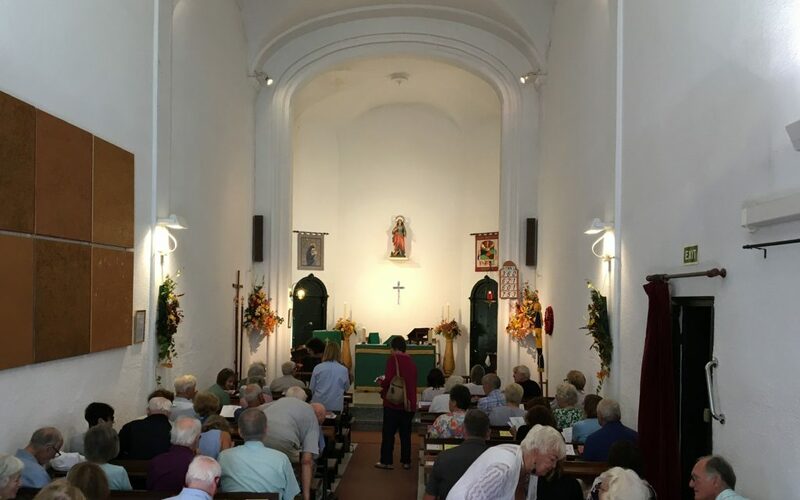 The roots of Anglican worship in Menorca go back to the 1960s, when communion services were held every other month in the homes of local Anglicans. 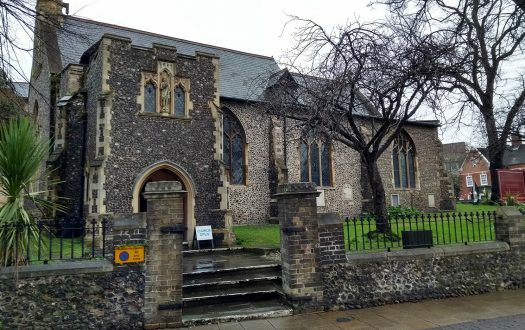 By the mid 1980s, services were being held once a month, and in 1985, the little-used chapel of the Carmelites was offered on permanent loan to the Anglican Church. The first resident chaplain was appointed in 1992. Santa Margarita’s is the only English-speaking church on Menorca. 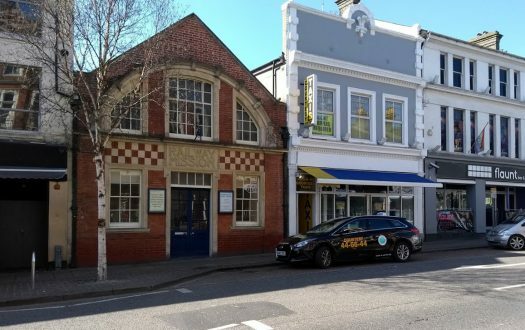 They sponsor the JaFfA Club (for children and well-behaved adults), which meets on the first Saturday of each month and features stories, games, arts and crafts relating to a particular theme such as fruits of the Spirit or the Good Shepherd. Santa Margarita's is also a popular venue for baptisms and wedding blessings (marriage being a civil matter in Spain). The service was led by the church’s permanent chaplain, assisted by a tall, slender man, robed in white, who served as sacristan. I was amazed to see that all the pews were full at this end of season service, with space for us only on the very front row. I counted somewhere between 70 and 80 people in the congregation. A couple of smiling, friendly ladies on the door welcomed us with hymn books and service leaflets. We immediately felt at home. I’m sure the pews were perfectly fine, but someone must have considered them so purgatorial they had placed hassocks on them, which we all perched on quite comfortably. The congregation of mostly elderly British expats were happily taking possession of their pews and catching up with one another. It was a beautifully warm and sunny morning outside, and that was also the climate inside the church. The chaplain, a strikingly fine gentleman with a mop of white hair and a manicured white beard, bade the congregation an emphatic ‘Good morning!’ which they warmly and readily echoed back to him. The hymn book was Hymns Ancient & Modern (2013 edition). The liturgy was apparently from Common Worship, printed in the service sheet. The gallery at the back of the church carries a substantial electronic organ that complements the building very well in volume and tone. We were blessed by having an exceptionally good organist, who was apparently filling in for a few weeks. Several unexpectedly generous and deeply bronzed cleavages. The congregation loved singing and launched into each hymn with huge enthusiasm. When the organist played the introduction to ‘Dear Lord and Father of Mankind’, everyone started humming along to Parry’s tune as if they couldn’t wait to get started. The liturgy on the service sheet was based on Common Worship, although we sang a version of the Gloria to Cwm Rhondda, and a paraphrase of the Creed to a tune I hadn’t heard before. 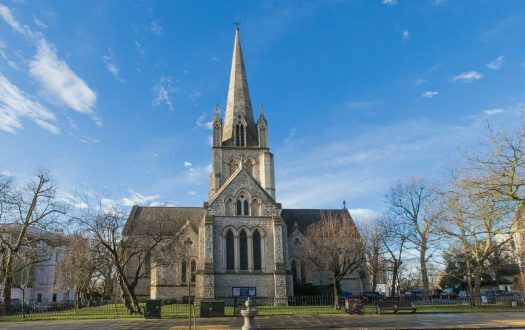 Our final hymn was the joyful ‘O Praise Ye the Lord.’ Hubert Parry’s marvellous tune, which the organist and congregation took at a fair clip, practically took the roof off. 8 — The preaching was admirably full of good stories, memorable reflections, eye contact with the congregation, and minimal attachment to notes on the iPad the chaplain held. If there are kneelers in heaven, they will need to be at least as comfy as the ones at the communion rail in Santa Margarita’s. The altar step is polished granite, but the long cushion laid on top of it is almost too soft and squishy. I sank down into it to receive communion and it was like kneeling on a luxury mattress. It’s not strictly infernal, but the narrowness of the chapel building causes traffic congestion at the altar rail. Only six people were able to get to the rail to kneel side by side, and with over seventy people queuing for communion, the altar party had to make at least twelve passes of the rail to give them all communion. It looked exhausting. The chaplain stood at the sunlit church door to shake hands with everyone as they went out, so I joined the long line stretching right back almost to the altar of people waiting to shake hands and leave. At that moment, the organist struck up the fantastic Nun danket alle Gott by the early 20th century German composer Siegfrid Karg-Elert, one of my favourite organ pieces, so I spent my time in the queue revelling in that. I sadly had to leave straight after the service, so I wasn’t able to join the regulars for tea and coffee in the courtyard next door. 10 — I hope to visit againwhen I’m next in Menorca. Yes, by a wide margin. The holy euphoria of that final hymn, sung by a very happy and enthusiastic congregation.